I resolved this year to be as authentic as possible, to be honest and courageous in owning my identity and speaking my truth. I’m generally not shy about asserting myself, but I’m also a person who adapts to make others more comfortable. Which means that I’ve usually avoided discussing cannabis with people who don’t support it. But because of my new orientation, I’ve had many candid conversations with friends, family, neighbors, and even cab drivers about cannabis reform, conversations I would have avoided six months ago but eagerly initiated in order to clarify my position that there should be no shame around responsible consumption. 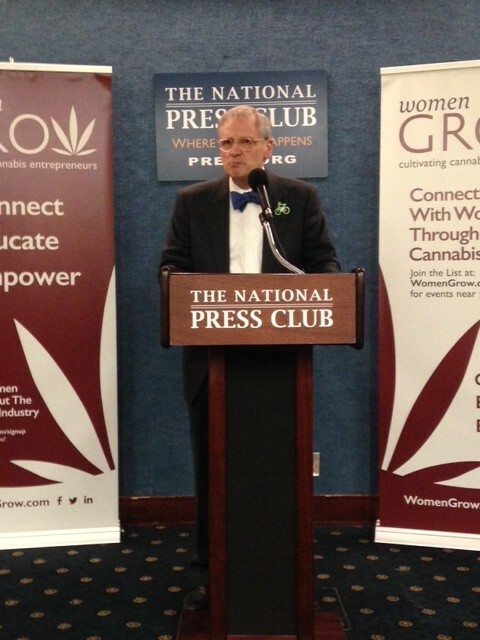 So it was only fitting that I joined over 70 other women in Washington, D.C. last week, lobbying on behalf of Women Grow and the cannabis industry. In the ultimate statement of legitimacy, we came out of the basement to Congress. Women Grow’s first official Lobby Days were an overwhelming success. Dozens of women representing states from across the country joined forces to impact cannabis law reform and educated close to one hundred congressional representatives about the benefits of a robust and regulated cannabis industry. 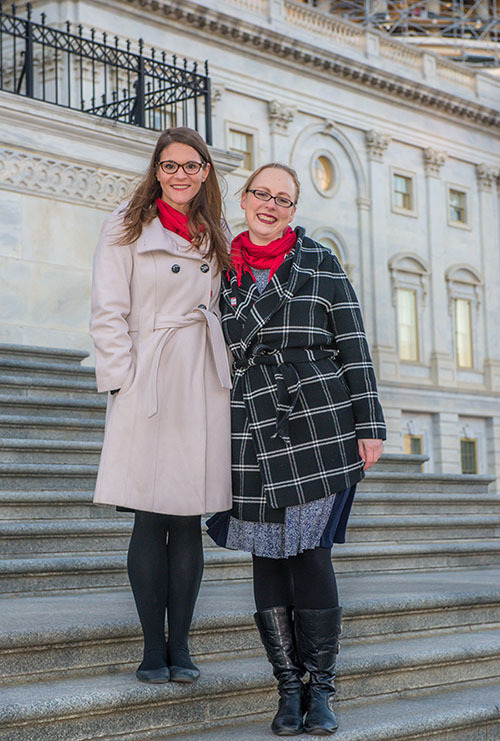 Dispensary owners, cultivators, scientists, compliance consultants, marketing and media professionals, activists, and attorneys all gathered on the Hill to seek support for woman-owned businesses and specifically for fair tax regulations and access to banks. Currently, state-legal businesses that sell cannabis are forced to deal in cash because most banks are reluctant to work with an industry that is technically federally prohibited. In order to proactively remedy this public safety issue, industry advocates are pushing for a bill that would provide a legal safe harbor to financial institutions that do business with the cannabis sector. In addition to being denied legitimate banking, cannabis dispensaries are required to pay between 50 and 70 percent of their net income to the federal government, due to section 280E of the tax code, which prohibits these state-legal businesses from deducting normal expenses such as rent and advertising. The three components of Women Grow’s mission – to connect, educate, and empower female cannabis industry leaders – were in full effect during Lobby Days. 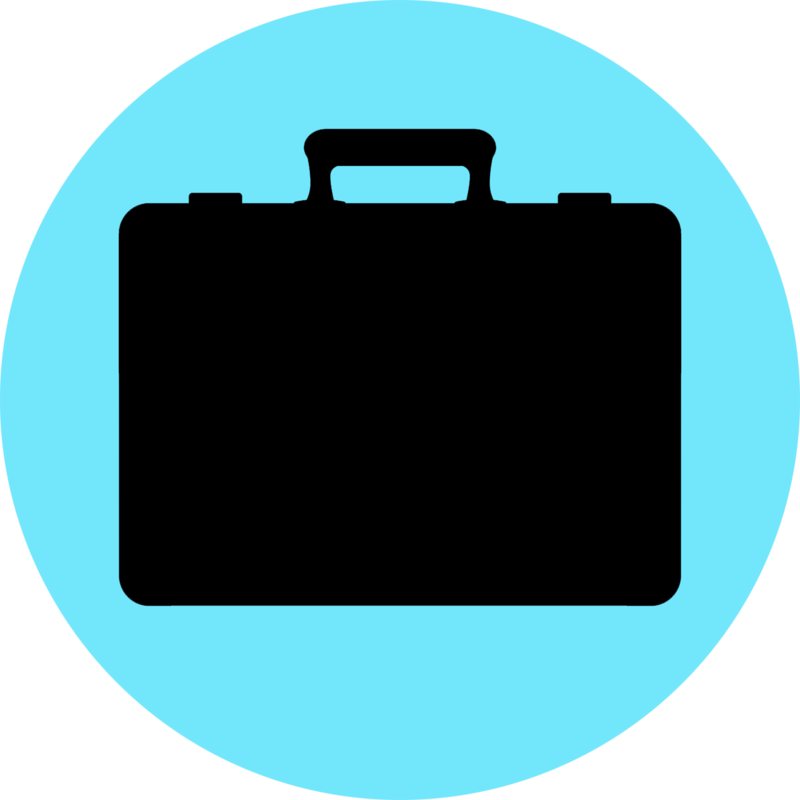 There was an atmosphere of support and inclusivity, where novices felt comfortable speaking up because of the mentorship of seasoned industry advocates, where everyone had something to offer and everyone had something to learn. We were armed with the right information so we could make a compelling case, and we were encouraged to share our own stories as evidence that the cannabis sector is a diverse and responsible community. This approach met with a lot of success. Congressional representatives listened receptively, posed important questions, and expressed some surprise at our level of professionalism and expertise. 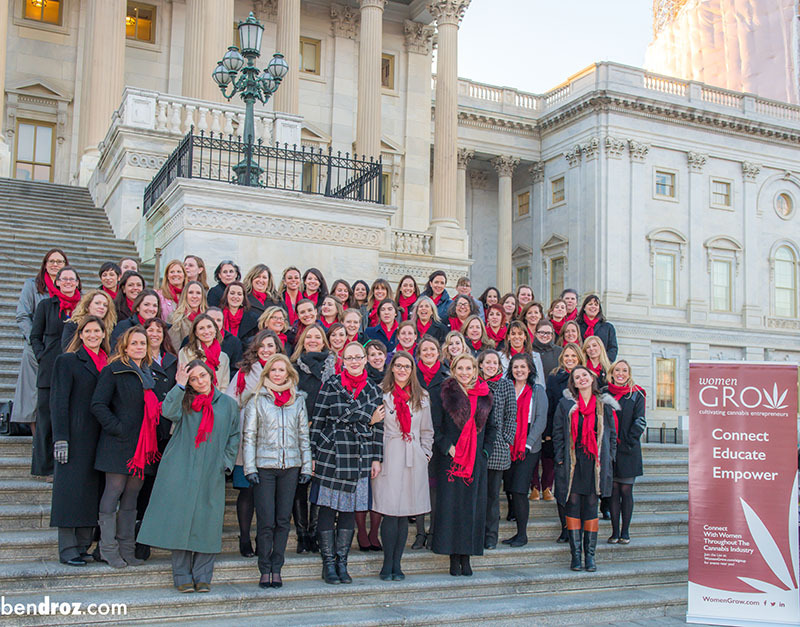 It’s safe to say that when Women Grow came to Washington wearing red pashminas, everyone noticed and everyone wanted to know more. Though we are underrepresented in virtually every other business sector, especially in positions of power, women have the potential to lead the cannabis industry, and this industry has the potential to be huge. What if women were at the forefront of the nation’s fastest growing industry? How would that transform business? Society? First, women are tremendously invested in building a responsible industry, and we know the key to a responsible industry is self-regulation. A responsible industry does everything it can to keep cannabis out of the hands of children, including childproof packaging and accurate labeling. A responsible industry generates informed consumers and markets its products to adults; its advertising reflects the class and maturity of a connoisseur and models sensible consumption. A responsible industry values diversity, inclusivity, and collaboration and creates spaces where all voices are welcome. These are the perspectives that have shaped the legal cannabis landscape, and that’s largely thanks to women entrepreneurs. Simply put, we need more female leaders. The world needs more female leaders. The women who rallied for Women Grow last week bring amazing leadership skills to the table; they are brilliant and savvy, powerful and motivated, some of the most tenacious, hardest working people I’ve ever met. And they are also full of heart, they are generous and compassionate and care so much about each other, about justice and healing, about the environment and the world. They understand the importance of empathy, cooperation, and balance, and they want an industry that reflects those values. The leaders of the future will lead with their hearts as much as their minds, and the cannabis industry, with these women as pioneers, will be a model for responsible, compassionate, sustainable business. There’s something really exciting about assembling at the National Press Club, about sitting in a congressional office with a group of women in suits, explaining the history of cannabis regulation to lawmakers. We are part of a culture shift that’s happening around the country, an evolution in the cannabis industry; we are redefining cannabis culture, and we’re changing Washington’s perception of what a cannabis consumer, advocate, or industry professional looks like and cares about. We are proud to assert who we are and why we’re here because we know that the positive interaction we’ve just had with a senator’s Chief of Staff could change someone’s mind about cannabis, because we know that our presence challenges the stereotypes that are so engrained in our collective consciousness. And, if you can talk openly about cannabis in the halls of Congress, you can certainly come out of the basement to your parents. Posted in Features, Out of the Basement and tagged 280E, banking, cannabis industry, cannabiz, jazmin hupp, legal cannabis, lobby days, NCIA, small business, taxation, woman owned businesses, women grow, women leaders.